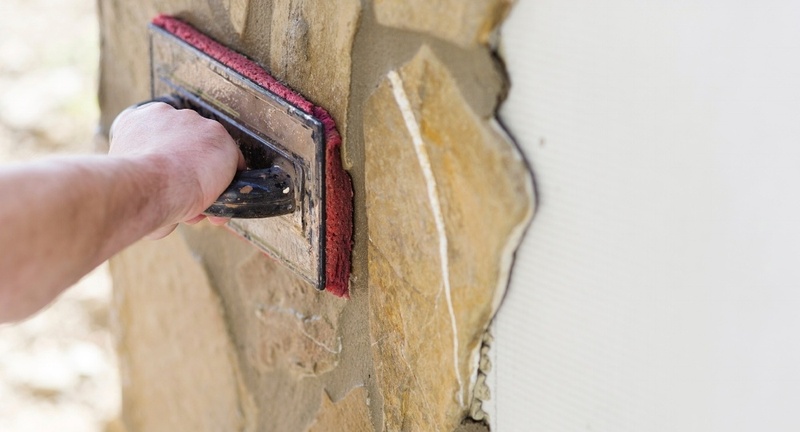 For any thin brick or thin stone veneer project, properly preparing the surface is a key to preventing water damage, ensuring lasting beauty, and making sure the materials remain structurally sound for the life of the installation. Today, there are more options than ever for selecting products that are specifically formulated for a wide variety of applications. Here are four of the most effective solutions for common thin brick and thin stone veneer applications that not only get the job done well, but actually make the job easier. Many tradesmen understand that in any project the base of a structure is as important if not more important than any other part of the construction process, if the base is weak the building will shift and eventually fall. This is true when preparing a structure to accept thin brick or thin stone masonry. In the past the masonry was attached only after applying building felt, metal lath, and finally a scratch coat of type N, S, or Portland mix had been added. Today with budget and time constraints on projects new products are constantly being developed. Products that will allow material to be placed in 2 to 3 hours, be water and frost resistant, and accommodate interior or exterior installations. An effective product solution for those scratch coat needs is Ardex AM 100, a rapid set pre tile smoothing and ramping mortar that cures in as little as three hours. Ideally suited for those demanding time and budgeting installations where a rapid installation time is key. As the building and masonry industries move forward in developing new techniques for the installation of today’s thin veneer materials, one of the biggest changes has come in the area of backing material, and thin set mortars for thin veneer installation. The benefits of some of the new thin set mortars such as Ardex X77 are many, some of which are listed below. Ideal for setting porcelain, glass, quarry, moisture sensitive stone, ceramic and all types of mosaic tile. Use over exterior concrete and masonry surfaces and over common interior surfaces, including exterior grade plywood. 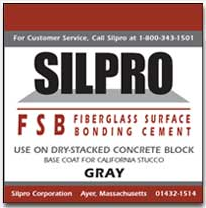 For projects using cement board, the easiest and most effective product to work with will be something that allows for easy adjustments and clean application. When installing thin brick, or stone veneer over rigid foam insulation board, there are many factors to consider. The material used needs to provide a protective base for the material being installed, while adding strength and integrity to the wall system as a whole. There are a few accepted installation practices out there when it comes to veneer over foam board. 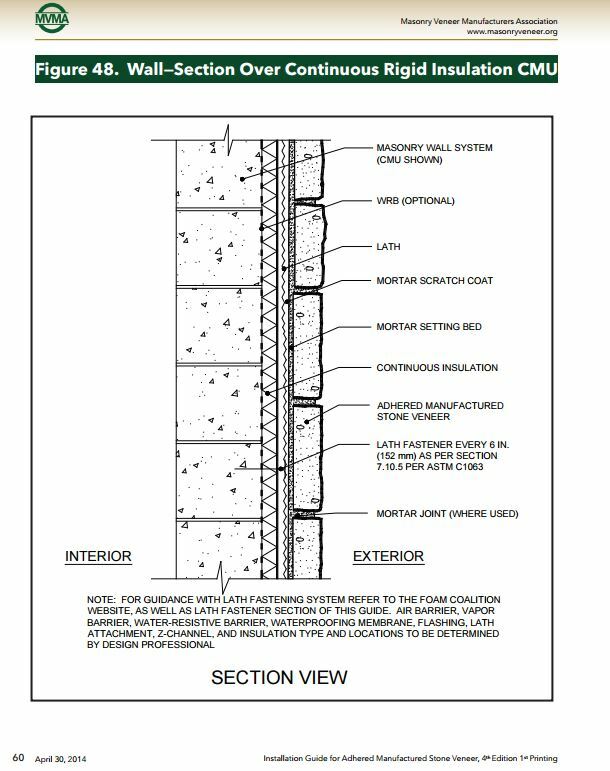 Below is a diagram outlining one of those accepted methods from the MVMA Installation Guide for Adhered Stone Veneer. In a changing industry, many installers will use a mortar scratch coat and then, rather than using a mortar setting bed they will use a product like Ardex x77 and then apply their veneer. For exterior installations of thin veneer whether it be thin brick, manufactured, or clay, manufactured, or natural thin veneer stone the specified requirements today are for the addition of an air and water/moisture barrier such as Ardex 8+9. 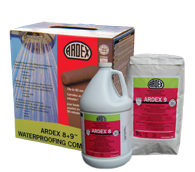 Products like the Ardex 8+9 add several benefits to the building envelope. Some of the benefits include: crack isolation, paint roller applied, helps prevent efflorescence, readily accepts thin set mortars, ideal for residential and commercial applications where thin veneer materials are to be installed and the possibility of moisture exists. Depending on the surface and the application, the proper way to prepare for thin brick or thin stone veneer installation differs. Together, these products represent some of the best and most effective ways to prepare a variety of surfaces.